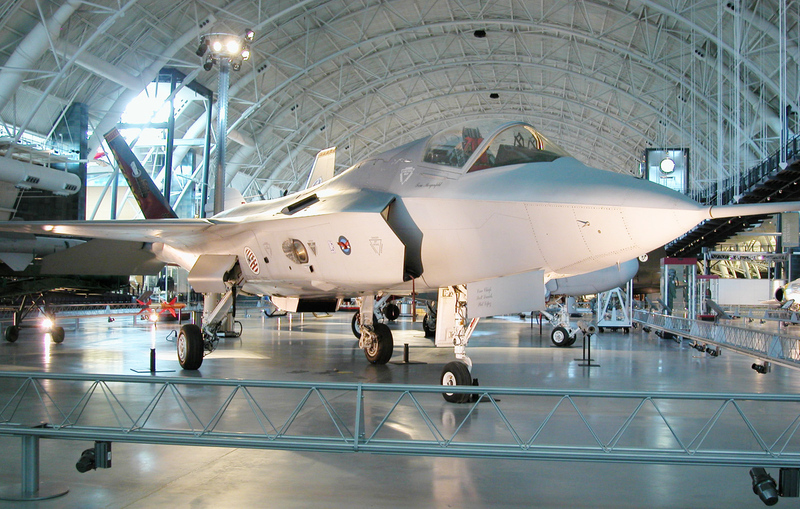 This aircraft is the first X-35 ever built. 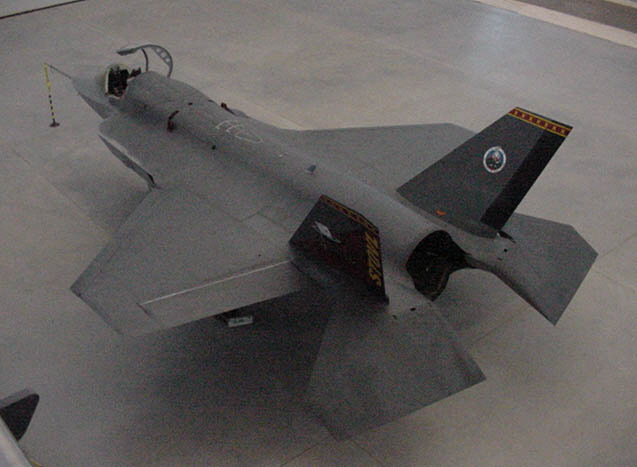 The X-35B flight test program lasted from 23 June 2001 to 6 August 2001. Panoramic view inside the Lockheed X-35B Joint Strike Fighter. This aircraft is the first X-35 ever built. 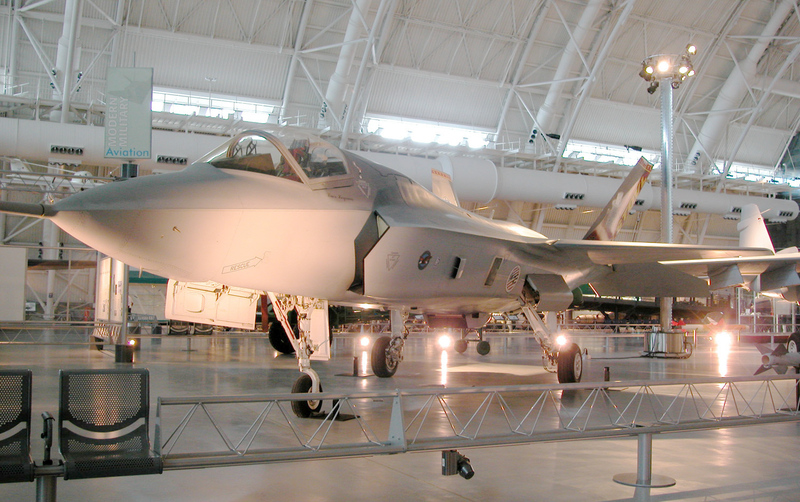 It was originally the X-35A and was modified to include the lift-fan engine for testing of the STOVL concept. Among its many test records, this aircraft was the first in history to achieve a short takeoff, level supersonic dash, and vertical landing in a single flight. It is also the first aircraft to fly using a shaft-driven lift-fan propulsion system. The X-35B flight test program was one of the shortest, most effective in history, lasting from June 23, 2001 to August 6, 2001. The lift-fan propulsion system is now displayed next to the X-35B at the Steven F. Udvar-Hazy Center near Dulles Airport. On July 7, 2006, the production model F-35 was officially named F-35 Lightning II by T. Michael Moseley, Chief of Staff USAF. The X-35B is the technology demonstrator for the F-35 Joint Strike Fighter, a stealthy, supersonic, multi-role fighter. After meeting the goals for the conventional takeoff version, the X-35A was modified into the X-35B for testing the short takeoff/vertical landing (STOVL) features. Three operational F-35 versions are planned. The conventional variant (F-35A), designed for the U.S. Air Force, will be built in the largest quantities. The U.S. Navy's carrier variant (F-35C) features larger wing and control surfaces, additional wingtip ailerons, and a strengthened internal structure to absorb the punishment of catapult launches and arrested landings. The wings also fold for better storage aboard carriers. The short takeoff/vertical landing variant (F-35B) will be used by the US Marine Corps, the United Kingdom's Royal Air Force and Royal Navy, and the Italian Air Force and Navy. Budget constraints continue to impact the future of the F-35 and the final production run has not yet been determined. 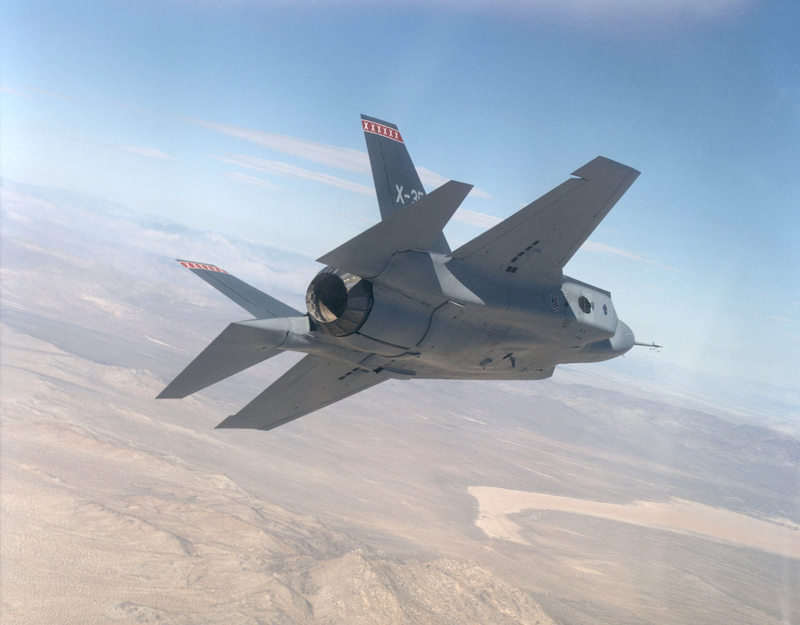 The STOVL version (F-35B) is equipped with a shaft-driven lift-fan propulsion system, which enables the aircraft to take off from a short runway or small aircraft carrier and to land vertically. The F-35, as the production version is designated, was conceived as the replacement for many aging fighters, such as the F-16, A-10, F/A-18 and AV-8B Harrier. Given the rapid development of unmanned aircraft, the F-35 may also be the last piloted fighter produced in large numbers. The massive lift-fan propulsion system can now be seen on display next to the X-35B at the Steven F. Udvar Hazy Center near Dulles Airport. The Pratt & Whitney JSF 119-PW-611 turbofan deflects thrust downward for short takeoff/vertical landing capability. The Air Force and Navy versions use a thrust-vectoring exhaust nozzle. The Marine Corps and Royal Air Force/Navy version has a swivel-duct nozzle; an engine-driven fan behind the cockpit and air-reaction control valves in the wings to provide stability at low speeds. This unique propulsion system won the prestigious Collier Trophy in 2001. Composite material aircraft skin, alternating steel and titanium spars. Single-engine, single-seat configuration includes lift-fan and steering bars for vertical flight. Short takeoff/vertical landing variant to be used by U.S. Air Force, U.S. Marines and the United Kingdom, equipped with a shaft-driven lift fan propulsion system which enables the aircraft to take off from a short runway or small aircraft carrier and to land vertically. Engine: Pratt & Whitney JSF 119-PW-611 turbofan deflects thrust downward for short takeoff/vertical landing capability. The Air Force and Navy versions use a thrust-vectoring exhaust nozzle. The Marine Corps and Royal Air Force/Navy version has a swivel-duct nozzle; an engine-driven fan behind the cockpit and air-reaction control valves in the wings to provide stability at low speeds. Other major subcontractors are Rolls Royce and BAE.